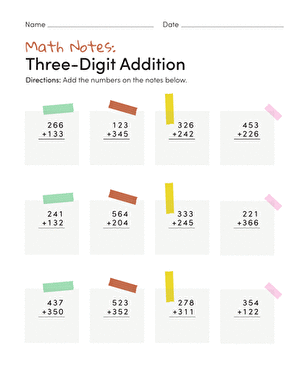 Math minutes are an exciting, fast-paced way to get in lots and lots of arithmetic practice. 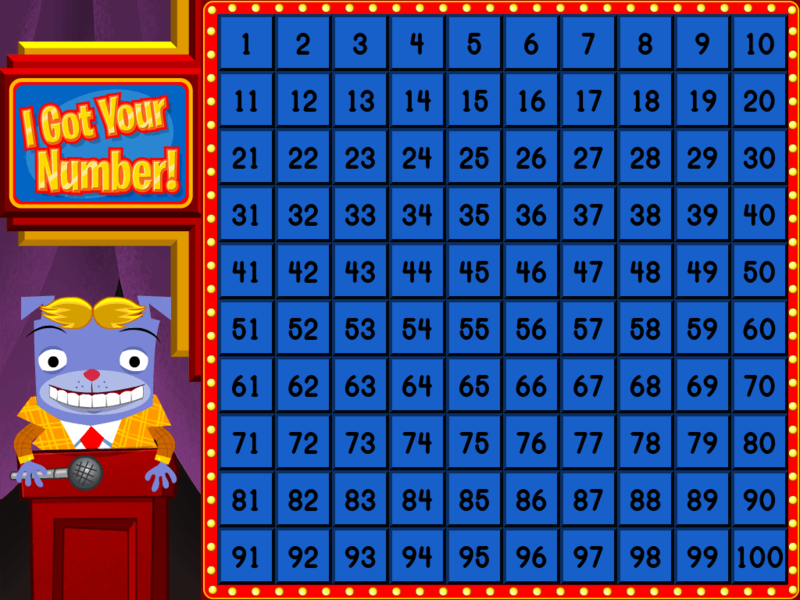 Have your kid amp up his competitive spirit and race against the clock to solve as many addition problems as he can in just two minutes. He'll soon find that it's satisfying to beat your own time and score! Your second grader will practice adding up to 50 while building her logic and problem solving skills with these math puzzle boxes. Put your second grader's math skills to the test with mathematical puzzle boxes. He'll practice doing addition facts in his head, and build logic skills. Kids solve addition problems with three-digit addends and no regrouping on this second grade math worksheet. Kids solve addition problems with two-digit addends and no regrouping on this second grade math worksheet. 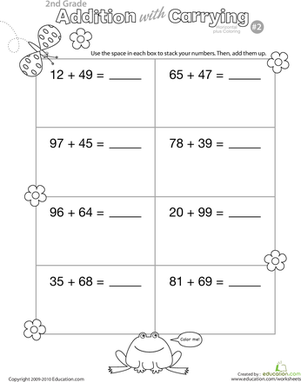 Combining addition and carrying practice with coloring, this second grade math worksheet is anything but dull. 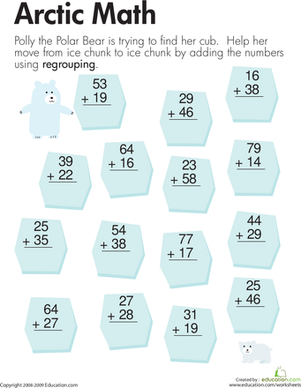 Kids solve addition problems with two-digit addends to move from ice chunk to ice chunk and help Polly get to her cub on this second grade math worksheet. 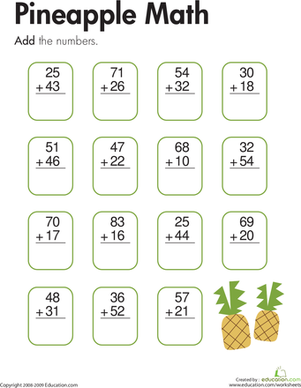 Make practicing math fun with math puzzles. Your child will learn the basics of solving logic problems as he does math in his head. 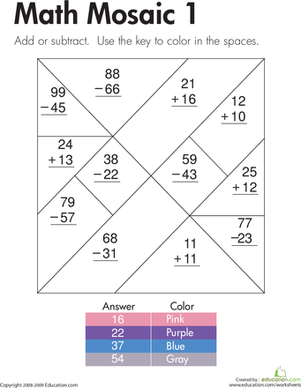 After kids solve the two-digit addition and subtraction problems on this second grade math worksheet, they use the key to color in the shapes on the mosaic. 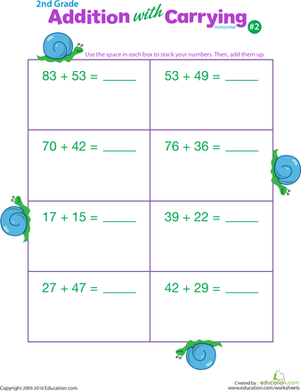 Help your second grader grasp the concept of carrying numbers in addition equations with this entertaining worksheet! Does your second grader need a math boost? Help her get a grip on her two-digit addition skills--and a super power--with this dynamic worksheet.